Everything is better if you do it with your BFF right? Well here is a chance for you and your bestie to get a makeover together, by the fashionista Sonam Kapoor herself! Tell L’Oreal why you would like to colour your hair with your best friend and you stand a chance to meet and get a fashion makeover by the diva Sonam Kapoor. 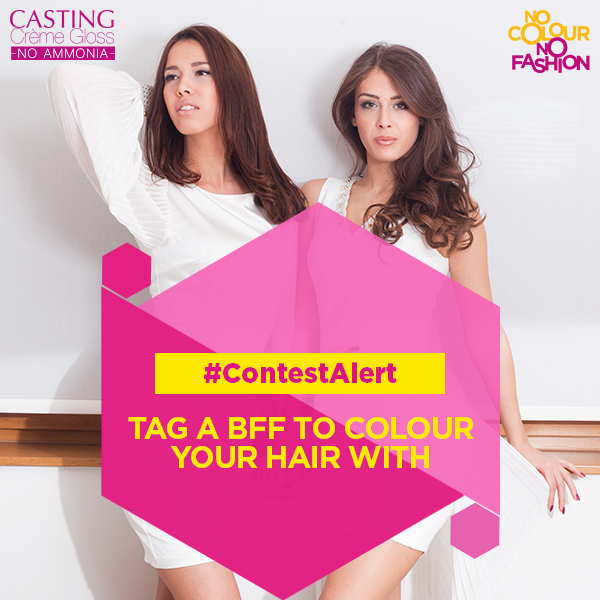 To enter the contest, tag your best friend on L’Oreal Paris India’s Facebook, Twitter or Instagram profile and tell L'Oreal why you would want to colour your hair together. L’Oreal Paris Casting Crème Gloss packs will be sent to the top 100 pairs who will then have to colour their hair and send in their awesome selfies to L’Oreal using the hashtag #NoColourNoFashion. Out of the top 100 BFF couples, 5 lucky BFFs will win a chance to meet Sonam Kapoor and get a makeover! The last day to enter the #TagAFriend contest is 21st September and you can have a look at the complete list of terms and conditions here. Let the tagging begin my friends!